A native to the Spice Islands, this is one of the sought-after spices that Columbus sailed the ocean blue in search of. These days, Indonesia and Grenada are the world's main sources of mace and nutmeg. Mace is often mentioned alongside nutmeg because both spices actually come from the same fruit. Nutmeg comes from the nut of the fruit's dried pit, while mace is the thick membrane which surrounds the nut's shell. 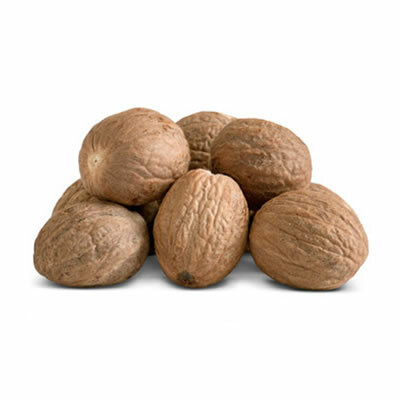 While mace is generally restricted to savory dishes, nutmeg is well suited to both sweet and savory fare. Nutmeg tastes like the holidays, and most people add it to holiday spirits like mulled wine, eggnog and cider, as its warm, sweet flavor is a pleasant addition. In addition to holiday beverages, sausages, baked sweets and puddings, nutmeg is often paired with cheese dishes and fillings and creamy sauces. Also try adding it to creamed spinach and mashed potatoes.